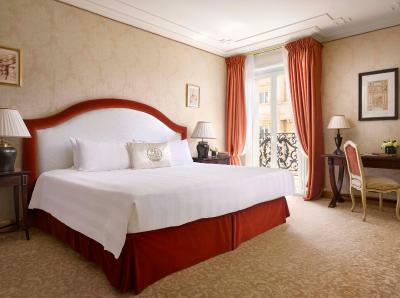 Lock in a great price for Hotel Metropole Monte-Carlo – rated 9 by recent guests! The hotel was all luxury and the staff’s customer service was 5 stars. Don’t hesitate in booking a world class experience. Gorgeous property, outstanding location. Only stayed 2 nights prior to our cruise but everything was first-class. 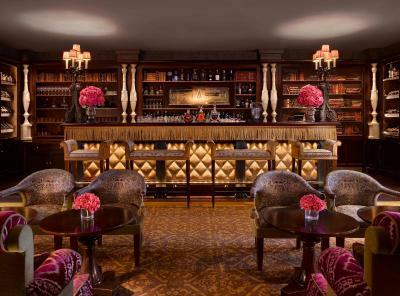 We have stayed in a number of top-rated hotels around the world and THIS is what a 5-star hotel should be. Wish we could have stayed longer to enjoy more of the hotel's amenities but we both give the Metropole our highest recommendation and look forward to many return visits. They only have a small one direction driveway that makes it a nightmare to enter and exit the hotel. Understaff! The property itself is beautiful, perfectly located; minutes walk from the famous Monaco Casino amongst other local attractions. The staff were great and always eager to help; particularly Matthias Piault! The concierge, really cool guy he helped me out a few times with some queries and recommended me the best clubs this time of the year; Buddha Bar & Twiga Monte Carlo; had an amazing eveningI also had some issues with getting in the main/famous casino; don’t bother going with any ripped jeans! Lol even if it’s high fashion haha! You will not get in unless your Flávio Briatore haha! 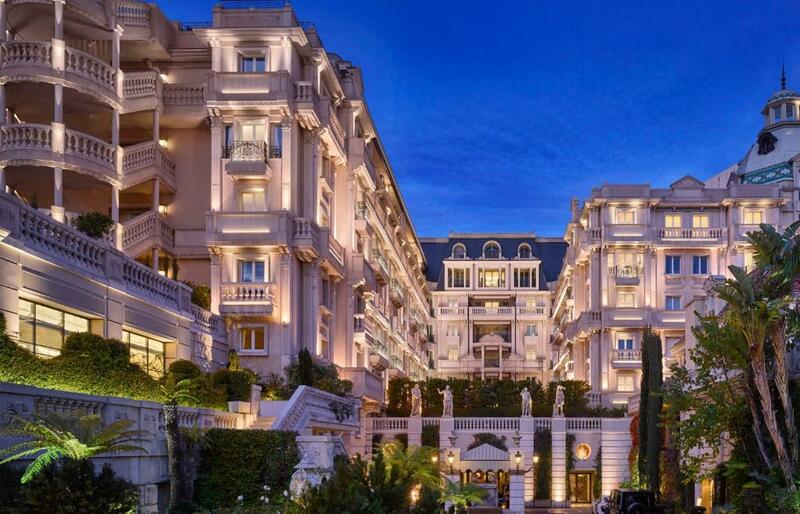 Hotel Metropole Monte-Carlo This rating is a reflection of how the property compares to the industry standard when it comes to price, facilities and services available. It's based on a self-evaluation by the property. Use this rating to help choose your stay! Hotel Metropole Monte-Carlo is located in the Carré d'Or in Monaco, less than 350 feet from the luxury boutiques and Casino Square. 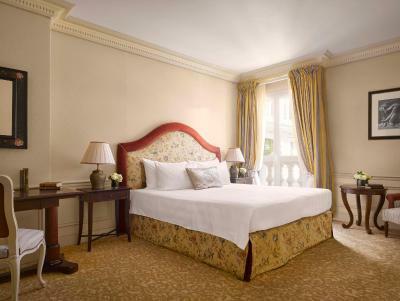 With a mix of classical and modern architecture, this hotel offers 125 rooms and suites decorated by interior designer Jacques Garcia. 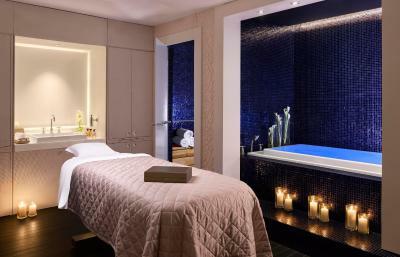 Guests can also relax in the onsite House of Givenchy spa. 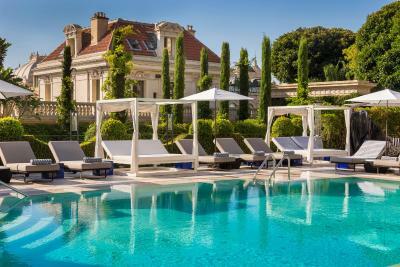 The property won first place for The Best Hotel in France and Monaco in the 2018 Condé Nast Readers’ Choice Awards and came third place for the Best Hotel in Europe. 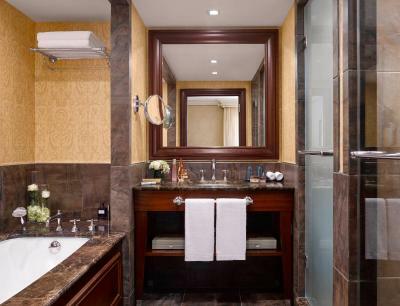 The air-conditioned rooms offers elegant marble bathrooms equipped with free toiletries. 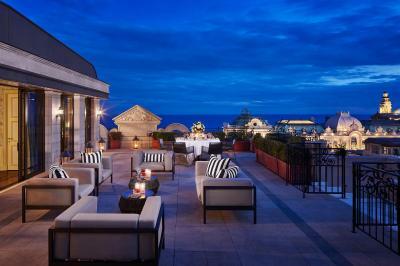 Hotel Metropole Monte-Carlo features 3 restaurants, serving dishes created by Michelin-starred chef Joël Robuchon. Guests can enjoy gastronomic cuisine at the Joël Robuchon restaurant, go to Yoshi for modern Japanese dishes or taste Odyssey's Mediterranean cuisine. 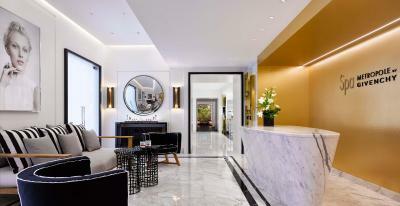 The House of Givenchy spa in Hotel Metropole Monte-Carlo is the first of its kind in Monaco. Designed by architect Didier Gomez, the Spa Metropole by Givenchy embodies the values of the House of Givenchy and offers care treatments and relaxation spaces. Guests are also invited to discover the exterior space with a heated seawater pool, gardens, a bar and a pool house. 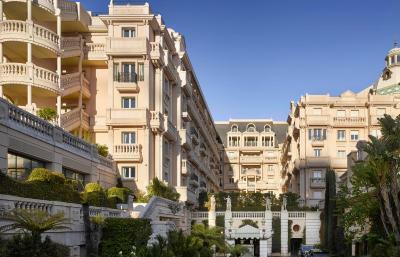 With private parking on site, the hotel is 1.2 mi from Monte-Carlo Golf Course. Nice Côte-d’Azur Airport is 12 mi away. Monte Carlo City Centre is a great choice for travelers interested in people watching, luxury brand shopping and gourmet food. 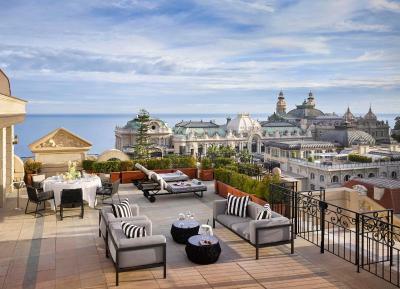 This property also has one of the top-rated locations in Monte Carlo! Guests are happier about it compared to other properties in the area. 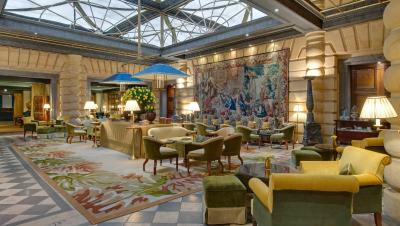 When would you like to stay at Hotel Metropole Monte-Carlo? 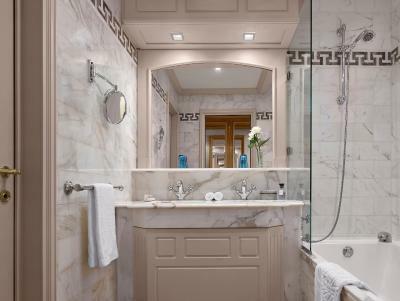 With views of the city of Monte Carlo or the hotel’s cypress-lined avenue, the Superior Rooms feature a private bathroom made of Carrara white marble and fitted with a shower or bath. Private parking is available on site (reservation is not needed) and costs EUR 39 per day. 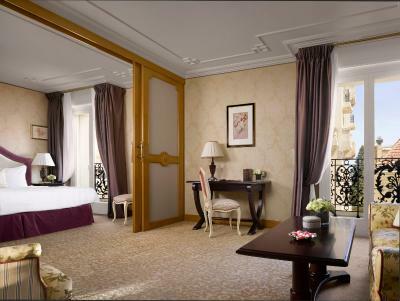 Located on the ground floor or upper floors, the Deluxe Rooms offer views of the city of Monte Carlo or the hotel’s cypress-lined avenue. The marble and mahogany wood bathroom has a massaging jet shower, large bath and double sink. 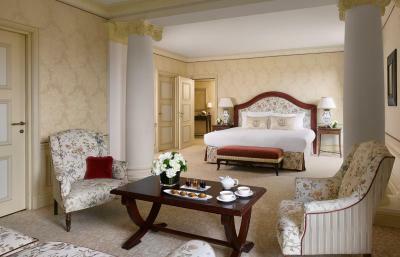 The Deluxe Junior Suites overlook the city or the hotel’s cypress-lined avenue. They feature a bedroom opening onto a lounge area. 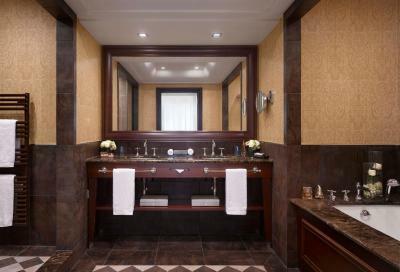 The marble and mahogany wood bathroom has a jet shower, large bath and double sink. 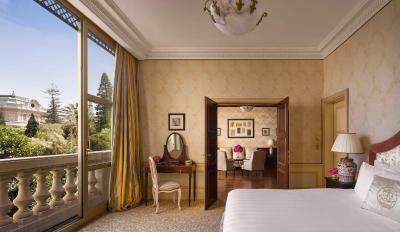 With views of the city of Monte-Carlo or the hotel’s cypress-lined avenue, the Superior Junior Suites feature a lounge, a bedroom and a white Carrara marble bathroom. 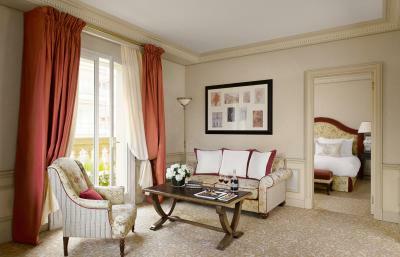 Located on the upper floors, the Deluxe Suites offer views of Monte-Carlo. 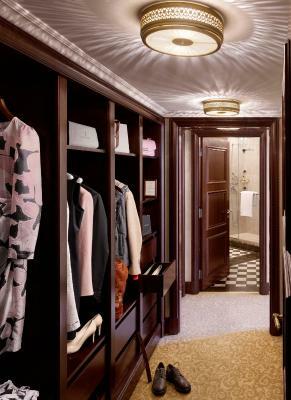 They feature a bedroom, a separate lounge, an office and a dressing room. 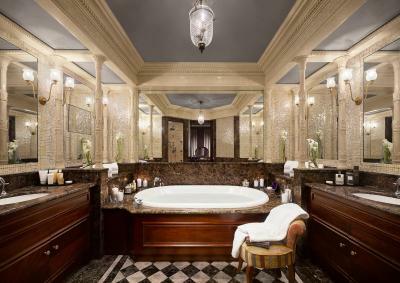 The marble and mahogany wood bathroom has a jet shower, a bathtub and a double sink. 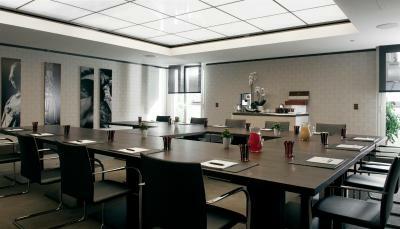 Prestige Suites are located on the top floor of the hotel. The entrance hall opens onto a separate living room and a terrace where guests can enjoy private sun loungers. 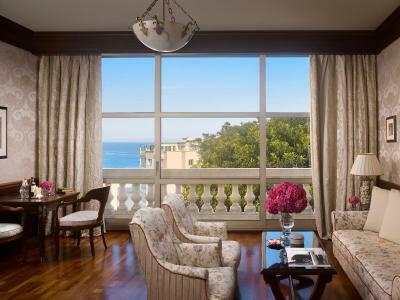 Located on the upper floors of the hotel, the Prestige Junior Suites overlook the city of Monte Carlo, the Mediterranean Sea or the hotel’s cypress-lined avenue. 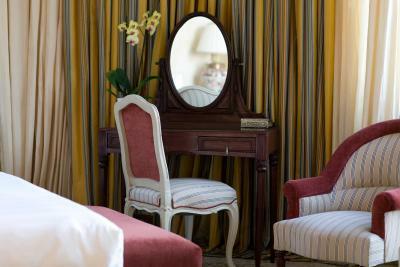 The bedrooms and lounges have been decorated by Jacques Garcia. The marble and mahogany wood bathroom feature a jet shower, a bathtub and a double sink. 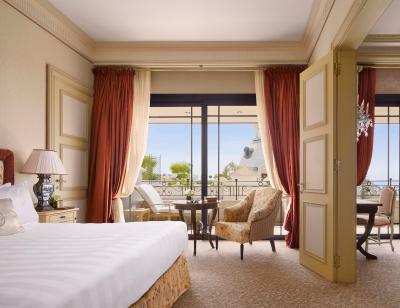 Located on the ground floor of the hotel, this Suite offers bay windows with a view of the Casino gardens and the Monaco Grand Prix circuit. 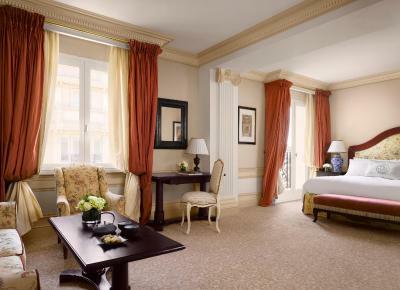 Located on the top floor of the hotel, this large suite includes a living room, a bedroom, a walk-in wardrobe and a marble and gold bathroom. 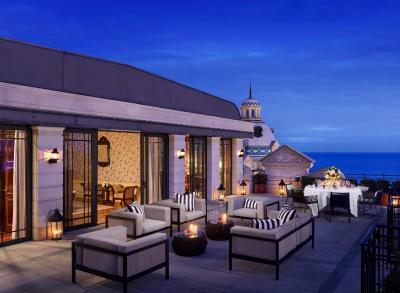 The 361 feet² terrace offers panoramic views of the Monte Carlo Casino, its gardens and the Mediterranean Sea. 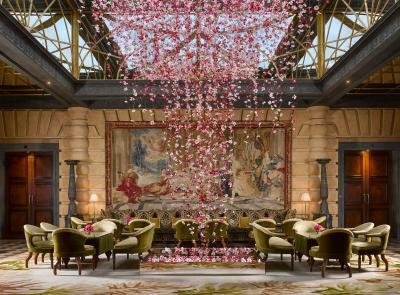 Located in the Carré d'Or, a few meters away from the famous Casino Square and its gardens, discover the most intimate, classic and timeless palace in town, home of world’s most Michelin star awarded chef, Joël Robuchon. Hotel surroundings – This neighborhood is a great choice for travelers interested in people watching, luxury brand shopping and gourmet food – Check location Excellent location – show map Guests loved walking around the neighborhood! 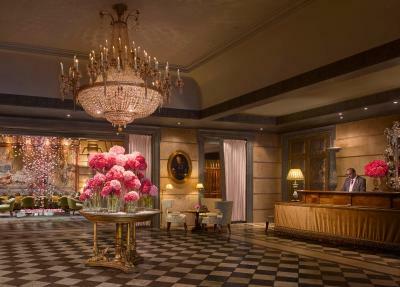 House Rules Hotel Metropole Monte-Carlo takes special requests – add in the next step! 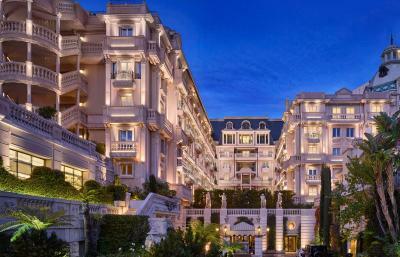 Hotel Metropole Monte-Carlo accepts these cards and reserves the right to temporarily hold an amount prior to arrival. Please note that the extra bed rate does not include the breakfast. It will be charged on top of the extra bed cost if requested. I booked via BOOKING.COM and was unaware that none of the amenities at the hotel were unavailable!! No pool, no spa, no gym! Which was unfortunate due to refurbishment for the summer season, but the girl who was assigned to assist me advised me that if I did want to use any of these services a shuttle can take me to a partnered hotel nearby and use there amenities free of charge. This was mostly down to BOOKING.COM for not advertising this on there platform, had I booked directly on the Metropole website I would have been aware of this issue. BOOKING.COM failed to share this information. Everything you would expect from a top 5 star hotel, courteous and helpful staff, great location and an excellent breakfast. The old furniture, bath and toilet needs to renew. I was so amazing. The first evening when I came back from spa they make me surprise with one bottle of vine .the staff are very friendly . Design of the lobby was excellent. Service was exceptional. Lovely hotel with old world charm. Great location. Amazing food. Can’t say enough good things. Nothing to be honest. We had the most amazing time. The staff was amazing. We traveled with 2 young children and they made sure we all had an amazing time. They were kind enough to bring the kids coloring books, juices, and chocolate. The food at breakfast was excellent although choices were limited.